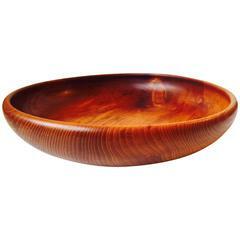 A small organically shaped nut or candy bowl fashioned out of a bended copper plate that has been linned with pewter. The 'legs' are made from brass. It was designed anonymously in Scandinavia during the 1950s in a style reminiscent of Henning Koppel, Tapio Wirkkala and Carl Auböck. Saxbo Danish stoneware bowl, marked Saxbo under the base, circa 1950s. Cute and elegant candy boxes carved in wood and brass parts. 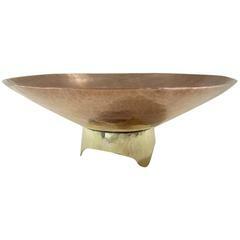 Exquisite brass and copper bowl in the style of Dirk Van Erp, beautifully hand-wrought. 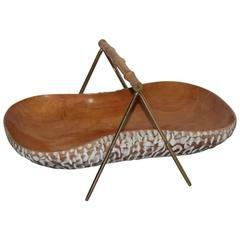 Modernist 1950s Pepe Mendoza bronze and enamel bowl. 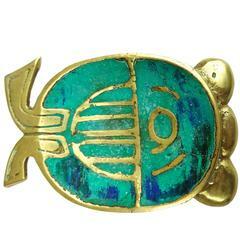 Paolo De Poli Italy, 1950s Enameled copper Peach and red / blue and green enamel "De Poli" signed Perfect condiction.